Drop this rock in vinegar and watch it grow! 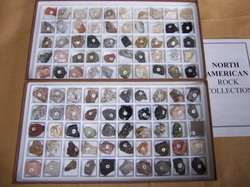 15 specimens in boxed tray with identification list with questions to answer about rocks. Also includes a rock cycle chart and magnifier. 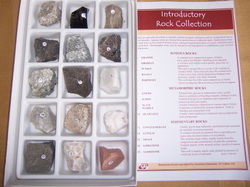 Great beginning kit; includes 5 each of igneous, sedimentary, and metamorphic rocks in boxed tray w/ identification list. 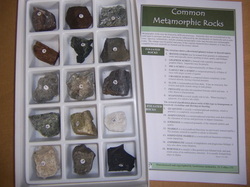 15 specimens 1.5 x 1.5"
12 each of all 3 major rock groups, showing characteristic features. ID list included. Same rock types as above (1320-010), only smaller for testing. 36 specimens 1/2 to 3/4"each. Large 3" x 4" specimens. Great for display and demonstration. Each in individual labeled tray, ID list included. Same rock types as shown above in 1320-010. 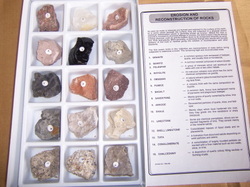 Each specimen is 2" x 3" to 3" x 3 ½" for greater testing and display. 12 specimens with identification list. 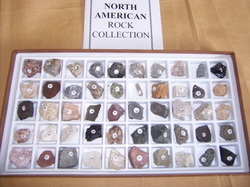 100 specimens in boxed tray representative of rock types found in North America. Specimen size approx. 1" x 1"